If you can do that, then you have a good grasp of the radio business. And that’s what this post is about. A truly great, impactful sports radio era has ended. The nearly four-year, year-round run of the weekly JoeBucsFan.com Hour inside the iconic Steve Duemig Show on WDAE-AM 620 is over. 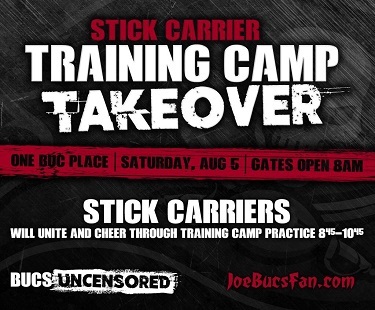 Station program director John Mamola advised Joe of the move on July 19 and cited one reason: the presence and content of the Bucs Uncensored podcast hosted by the Commish, Justin Pawlowski. Bucs Uncensored publishes three times per week on JoeBucsFan.com. The podcast is the most popular anywhere among those featuring Buccaneers talk, routinely pushing 10,000 downloads per episode over many platforms. In less than one year, Bucs Uncensored has opened a lot of eyes across the local media and advertising community with its rabid following, well-attended events, brash commentary, explosive growth and its hatching of the Stick Carriers, a large Bucs-fan movement that was strongly endorsed by Dirk Koetter and Vernon Hargreaves (Koetter audio here). Last week during the podcast, Pawlowski called WDAE host Ron Diaz an expletive and, per Mamola, that was too offensive to tolerate the JoeBucsFan.com Hour staying on the air with Duemig. Pawlowski is a former WDAE host and producer who once served as lead producer for Diaz’s show. Mamola also said Pawlowski’s negativity toward fired WDAE host Tom Jones were part of the decision since Mamola is hoping to rehire Jones for the radio station. Jones, a columnist for the Tampa Bay Times, drew the ire of many Bucs fans and Buccaneers team officials for his February gotcha story on Jameis Winston, which needlessly turned Jameis into a national punching bag on ESPN and CNN for three days. In June, Jones also penned a piece that claimed, “The rest of the country looks at Tampa Bay the way we look at the Bills, Browns and Rams.” And that further incensed fans and Pawlowski. Back in April 2016, Mamola broke a long-standing verbal agreement he had with JoeBucsFan.com. That prompted Joe to end the long-standing JoeBucsFan.com cross-promotional partnership with WDAE. It was no problem. That’s business. And the JoeBucsFan.com Hour with Duemig continued happily. But in April of this year, something very odd happened, something almost unheard of in the radio industry. WDAE showed no interest in taking Joe’s money. Joe made multiple inquiries — email and phone — to WDAE advertising sales chief Dave Barnett about purchasing ads on WDAE, and Barnett never even sent Joe an advertising proposal. Keep in mind that iHeart Media, the national ownership body of WDAE, is carrying nearly $20 billion in debt (yes, billion) and has been steadily laying off staff and aching for cash. Joe can only conclude that JoeBucsFan.com and its growing podcast network, featuring additional big names like Todd Wright and Ira Kaufman, became too threatening for WDAE, which has had a rough 12 months in the overall Nielsen radio ratings. Joe is quite confident the WDAE decision and the way it was handled was not a Steve Duemig call. And listeners of “The Big Dog” should not hold him accountable. Sam Nein, the Tampa president/market manager of iHeart Media did not return calls seeking comment for this story. Travis Daily, Mamola’s boss and a local iHeart senior VP, also did not return requests for comment. Yes, Joe is disappointed. Joining Duemig’s show was great fun with a great friend and, Joe believes, a great addition to Duemig’s iconic show. Joe was humbled to get the shot at prime time with Duemig — and it worked for many years. Joe always promoted the broadcasts with great pride. No, Joe doesn’t believe WDAE acted in the best interest of its audience, and it’s always sad when companies operate that way. But that’s business and Joe’s head is held high. As ex-Bucs defensive end Stylez White used to say, “Sometimes you’re the dog; sometimes you’re the tree.” Today, Joe is the tree, but a very, very strong and tall one.